The traditional answers are either 1) God or 2) the Big Bang just happened. Neither are good enough and I’ve been scribbling formulas and diagrams to come up with an equation that generates something from nothing. You’ll understand my delight when I found a mathematical answer to this conundrum. As you will see, the answer is deceptively simple but the question itself gives a surprising and perhaps original insight into that answer. Don’t reread this, I’m just building up the tension. Here goes. The answer to the paradox of something from nothing is to see that the “nothing” happed an infinitely long time ago. That deals with two issues. Firstly it allows for “nothing” and secondly it gets around the problem of “what happened before?” since there is no “before” something that happened an infinitely long time ago. That doesn’t mean that the Big Bang didn’t happen just a few billion years ago, but that is another question. Trying to equate this function and its derivatives to zero for t goes to minus infinity and to find the values of the coefficients a would be a little hard. There is an easier way. Although we’re interested in this being zero when t tends to minus infinity, we don’t mind if this is the case for other values of t. In other words, as long as the coefficient terms are zero, we meet the required conditions. By now you may be seeing where this is going. The function is simply the exponential function…! Inspecting the graph of this well-known function shows what we were expecting: a function that is zero in its distant past and becomes non-zero in the present. It also disappears into infinity in the future but that is another matter. Let’s review what we have just done. We have used the definition of “something from nothing” to define the exponential function. 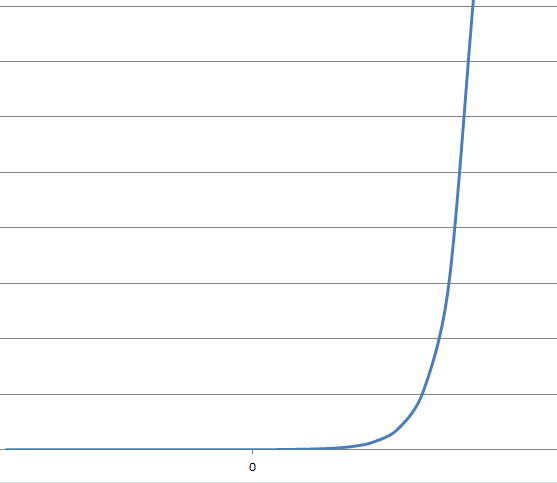 If you are used to seeing the exponential function you may well yawn here. So what? Personally I am amazed at the result of this analysis. We have created a very simple and fundamentally important function from a philosophical definition of “something from nothing”. The number e is known as Euler’s constant and the number itself is credited to another Swiss mathematician Jacob Bernoulli who discovered it while studying compound interest (…!). These mathematicians are by definition great but somehow I am much more seduced by the notion that the exponential function is established from first principles to answer the ultimate question about the origin of it all. How cool is that! Publish this! The Journal of Religion (U Chicago) could be a good window. They appear to be open to all sorts of things, especially thins. As short and simple as this is, I think it is worth writing a paper about it in arxiv.com. Never heard of this journal – the title scares me!!! True – and this is only the basic intro. If you follow this through, you get to creation of dimensions, time, fundamental particles and the massive acculumation of energy. Hi! I just found this, I know it was published a while ago now but I thought I’d still add my two cents. You propose the existence of a function which has 0 as a limit as t goes to minus infinity, but moreover you require that all of its derivatives have this property too. The first thing that I notice about that is that there’s heaps of functions that do that, so I’m not expecting a unique answer. For example, 1/t has this property, I’m not sure what metaphysical implications that yields! Anyway, so I thought about why it is you’ve gotten this answer rather than any of the infinitely many others and I’ve realised that in the step where you restrict attention to just f(t) and f'(t) you seem to have simply dropped the limit and said (paraphrased of course) “give me a function satisfying f(t)-f'(t)=0 for all values of t (not just in the limit as t goes to infinity)”. In other words, what function has the property that it’s equal to its own derivative. And that’s really where you found the exponential function! Thanks for your comment, good observations. The additional boundary conditions on all of the derivative of f(t) are important. Not only should the function be zero at minus infinity, there should be no possibility of it “taking off”. 1/t doesn’t quite do it. That is a something from nothing to nothing equation. I.e. although it comes from nothing it also disappears into nothing. But you may be right, there could be other solutions to the stated problem. Food for thought.